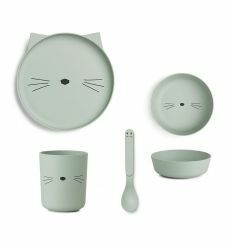 Liewood bamboo eco-dinner set (cat mint) composed by a cup, bowl, plate and spoon. Bamboo fibres are natural, toxic-free and biodegradable perfect for little love and environmentally correct. 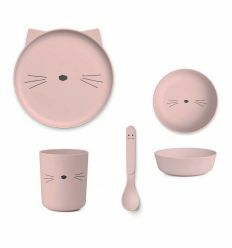 Liewood bamboo eco-dinner set (cat rose) composed by a cup, bowl, plate and spoon. Bamboo fibres are natural, toxic-free and biodegradable perfect for little love and environmentally correct. Liewood, placemat for kids (mint cat). This placemat is made of recycled silicone, has a silky finish so soft to the touch, and is certified for contact with food. Easy to clean, no-slip, folding placemat, perfect for baby food at home, school or on the road. Liewood, placemat for kids (rose cat). This placemat is made of recycled silicone, has a silky finish so soft to the touch, and is certified for contact with food. Easy to clean, no-slip, folding placemat, perfect for baby food at home, school or on the road. 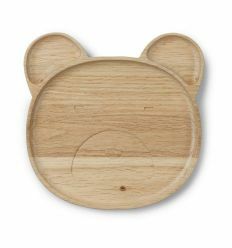 Liewood, oak bear plate: an hight quality product, super ecological and is suited for food contact and is approved according to European Union's regulations regarding food safety. 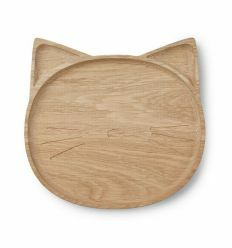 Liewood, oak cat plate: an hight quality product, super ecological and is suited for food contact and is approved according to European Union's regulations regarding food safety. Bamboo dinner set Beef, with bowl, sippy cup and feeding spoon. An ecological, organic product with an elegant design for the first meals with style! Bamboo dinner set Ocean, with bowl, sippy cup and feeding spoon. An ecological, organic product with an elegant design for the first meals with style! Bamboo dinner set rye, with bowl, sippy cup and feeding spoon. An ecological, organic product with an elegant design for the first meals with style! 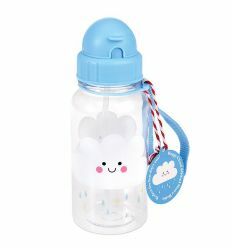 Cute Happy cloud children's water bottle with in-built straw. Easy to open, its a super handy travel accessory for kids! Perfect also for day trips, sports or school. 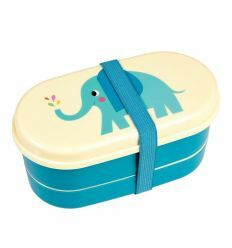 It can be combined with the lunch bag and lunch boxe of the same series. 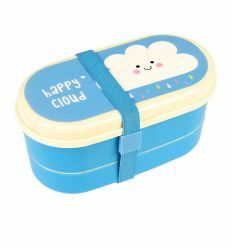 Kids will love this dual compartment bento box with fork, spoon, elastic strap and cute Happy Cloud design. Its practical and easy to open, ideal for meals at school or on the road. Check out the eco-lunch bag and water bottle of the same series for even more lunch fun. Sass & Belle bamboo eco-dinner set composed by a cup, bowl, plate and cutlery decorated with "My Black Star" print. Bamboo fibres are natural, toxic-free and biodegradable perfect for little love and environmentally correct. 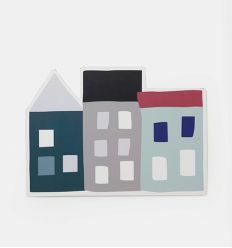 Ferm Living placemat by "Seaside" series: nordic design also at baby food time! The cork backside ensures the mat stays in place. 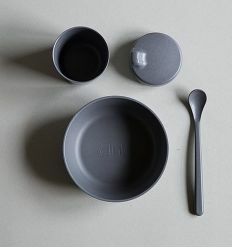 Coordinated with bamboo dinner set by Ferm Living. 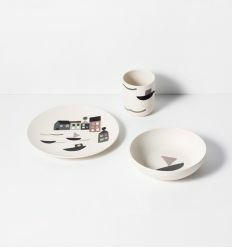 Ferm Living bamboo dinner set composed by a cup, bowl and plate decorated with "Seaside" print. Bamboo fibres are natural, toxic-free and biodegradable perfect for little love and environmentally correct. 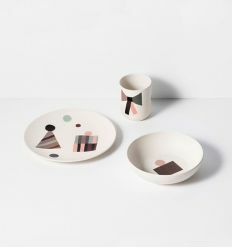 Ferm Living bamboo dinner set composed by a cup, bowl and plate decorated with "party" print. Bamboo fibres are natural, toxic-free and biodegradable perfect for little love and environmentally correct. 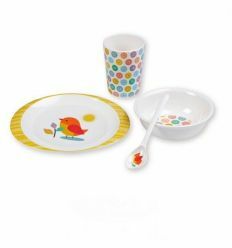 By Atomic Soda, a dinner set with lovely bird: includes bowl, plate, tumbler and a spoon. 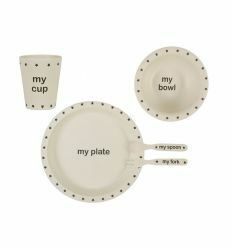 Atomic soda dinner set with a modern and functional design, are perfect for small and big eaters. 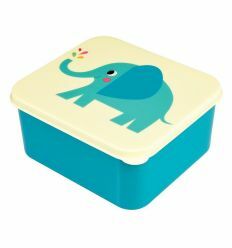 Lunch box with a funny Elvis the elephant print, the perfect size for a sandwich, ideal for meals at school or on the road. Check out the eco-lunch bag and water bottle of the same series for even more lunch fun. 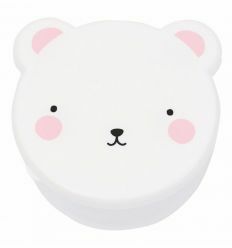 A Little Lovely Company, set of 4 nesting boxes bear (white/pink). Perfect for healthy snacks on the go. 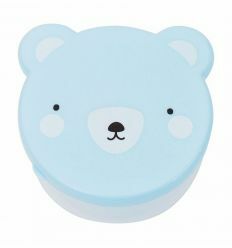 A Little Lovely Company, set of 4 nesting boxes bear (blue). Perfect for healthy snacks on the go. 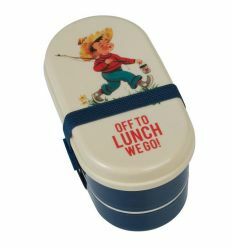 Lunch box with cutlery with a funny vintage boy print, practical and easy to open, ideal for meals at school or on the road. It can be combined with the lunch bag of the same series. 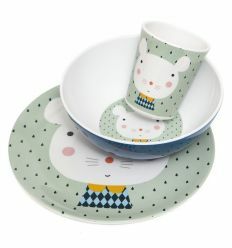 Petit Monkey dinner set (mouse green) with original design by Haciendo el Indio. 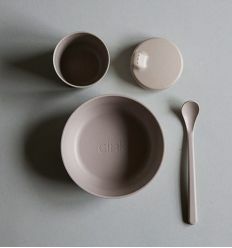 The set comprises of plate, bowl and cup made of melamine. Coordinated with "cutlery set (mouse green)" of the same series. 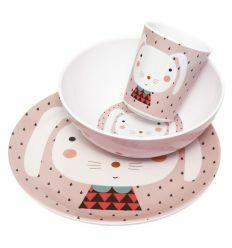 Petit Monkey dinner set (rabbit pink) with original design by Haciendo el Indio. 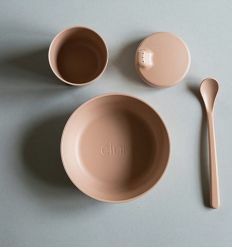 The set comprises of plate, bowl and cup made of melamine. 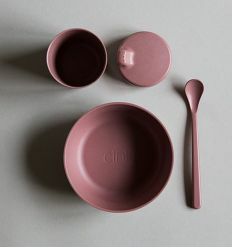 Coordinated with "cutlery set (rabbit pink)" of the same series.